It all began with a bet at a conference in Italy in 2013. Nicolas Vogel, Ph.D., then a postdoctoral fellow in Joanna Aizenberg's lab at the Wyss Institute for Biologically Inspired Engineering at Harvard University and Harvard's John A. Paulson School of Engineering and Applied Sciences (SEAS), gave a talk about the group's Slippery Liquid-Infused Porous Surfaces (SLIPS) coatings, which promised to prevent nearly anything from adhering to structures to which they were applied. In the audience was Ali Miserez, Ph.D., an Associate Professor of Materials Science and Engineering at Nanyang Technological University (NTU) specializing in biological materials who approached Vogel after the presentation and said confidently, "I bet mussels will stick to your coatings, because I still have yet to see a surface that they won't attach to." Vogel accepted the challenge and sent some SLIPS samples to Miserez upon returning to Cambridge, initiating a collaboration whose results are reported in this week's issue of Science. The study demonstrated that a certain form of SLIPS is indeed essentially mussel-proof, and shed light on how they thwart mussels' expert attachment mechanisms. "I badly lost the bet," says Miserez, who is a corresponding author of the paper along with Vogel (now a Professor at Friedrich-Alexander-Universität Erlangen-Nürnberg, Germany) and Aizenberg. "I think I owe Nicolas a nice dinner." Mussels are one of the worst perpetrators of biofouling, or the unwanted accumulation of organisms on underwater structures like pipes, boats, industrial equipment, and docks. Not only do biofouling organisms like mussels threaten to slice open an unlucky swimmer's foot, they have significant economic and environmental costs: the US Navy alone spends ~$1 billion per year on antifouling efforts, and many species are invasive pests that hitch rides to new environments on ships' hulls. 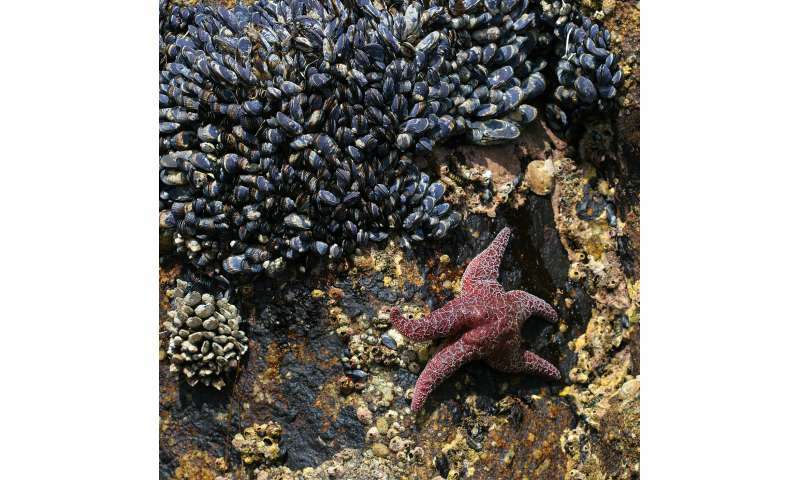 The vast majority of the weapons deployed against mussels and other clingers-on are paints and coatings that contain toxic chemicals, usually copper-based, that deter or kill organisms when they come into close proximity. These materials raise concerns because they poison species indiscriminately, accumulate in waterways, likely have ecological impacts, need to be replaced regularly, and are often not as effective as desired. Non-toxic "low surface energy" coatings based on silicone or siloxane polymers (compounds similar to those used in the medical industry for catheters) have been introduced as non-toxic alternatives, but while these materials do allow for easier removal of biofouling species, they are less effective at preventing organisms from attaching in the first place, and are susceptible to damage and decay. The Wyss' SLIPS technology, inspired by the slick lip of a carnivorous pitcher plant that sends insects sliding down to their doom, take advantage of the fact that it is very difficult for an organism to attach to a liquid surface. SLIPS consists of a solid surface infused with a liquid lubricant overlayer that is retained in place so that anything that comes into contact with the liquid layer will simply slide right off. SLIPS have previously been shown to be effective against bacteria and algae, but mussels represent a particularly intimidating foe. Their muscular feet produce adhesive filaments called byssal threads whose tips, called adhesive plaques, contain special adhesive proteins that remove water molecules from the target surface to enable the plaques to bind to it. "Mussels have mastered the skill of sticking in an underwater environment, despite water being the biggest enemy of adhesion," says Miserez. This system allows them to bind to surfaces extremely well: large accumulations of mussels can weigh as much as 1,700 pounds per square foot. To investigate whether SLIPS could hold their own against these expert biofoulers, the NTU team led by Miserez placed Asian green mussels on panels with a "checkerboard" pattern of different types of non-biocidal antifouling surfaces underwater, and let the mussels choose where to attach. Two different types of slippery surfaces infused with silicone oil as a lubricant were evaluated: a very thin, silica-based and nanostructured 2D coating applied layer-by-layer (i-LBL) and a thicker, matrix-like 3D coating made of the common polymer polydimethylsiloxane (i-PDMS). Non-lubricant-infused versions of those coatings, a tungsten oxide-based 2D coating, uncoated glass, and two commercially available non-biocidal foul release coatings (Intersleek? 700 and Intersleek? 900) were included for comparison. After 24 hours, Intersleek? 700 had ~75 mussel adhesive plaques per panel while i-PDMS had only five mussel plaques on one out of a total of fifteen panels, indicating that the mussels did not, in fact, stick well to i-PDMS. Not content with determining the winner of the bet, the NTU researchers continued their investigation to determine exactly why the mussels did not readily bind to i-PDMS: did the threads themselves not stick, and/or did the mussels refuse to attach them? To answer the first question, the team measured the force needed to pull the mussels' byssal threads off the various surfaces, and found that threads attached to the Intersleek? coatings required two to six times the force needed to remove threads from i-PDMS, and threads attached to the non-infused coatings needed ten times more force. "This is likely because the liquid overlayer of the lubricant-infused surfaces resists displacement by the mussels' adhesive proteins, keeping the surface lubricated and therefore preventing the byssal threads from binding," says co-first author Shahrouz Amini, Ph.D., who was a Research Fellow at NTU when the study was completed and is now a researcher at the Max Planck Institute of Colloids and Interfaces in Potsdam, Germany. Indeed, when a detailed biochemical analysis of the mussel footprints was performed, biomolecular signatures of the adhesive proteins were found on all the control materials but not on the Wyss' slippery surfaces. 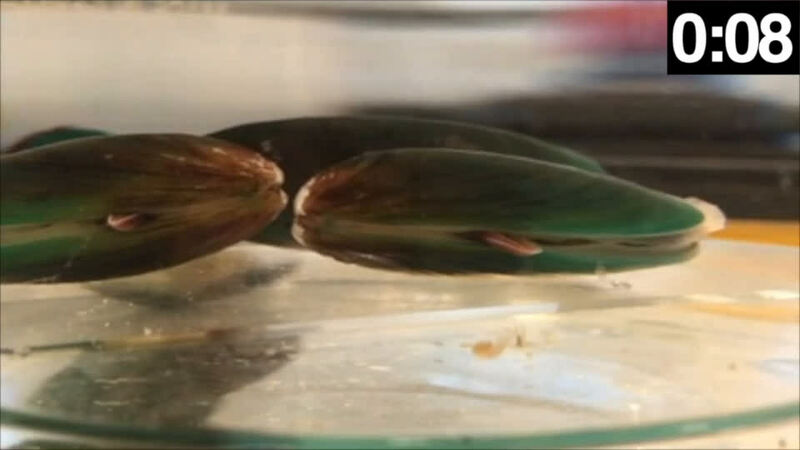 To see whether the mussels were also attempting to attach fewer byssal threads, the researchers placed them on each of the surfaces and observed them in real-time. 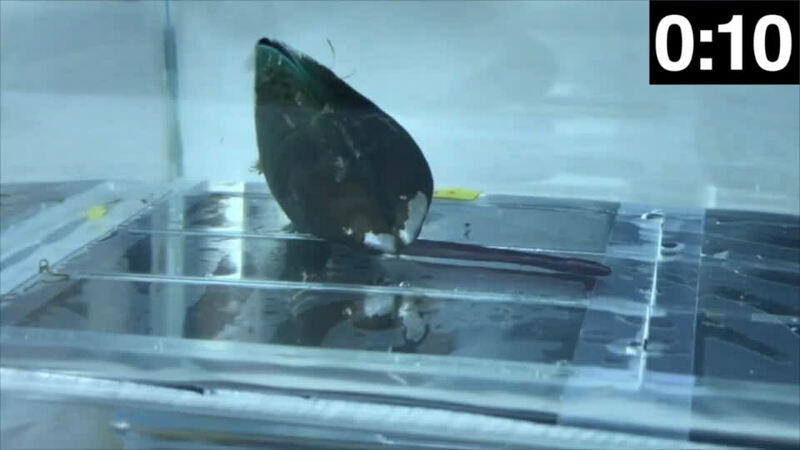 Mussels on the non-infused LBL and PDMS surfaces behaved normally, probing them with their feet for a few seconds before secreting threads, which formed within about 30 seconds. Those on 2D slippery surfaces, however, probed them for a significantly longer amount of time (30-80 seconds) and did not secrete threads, while those on i-PDMS displayed several aberrant behaviors: they chose to attach their threads either to their own shells or to a neighboring, non-SLIPS-coated surface; they secreted a viscous gel that did not solidify into a thread; or they probed the surface for only a few seconds before swiftly retracting their foot into their shell without attempting to secrete a thread. "In addition to disrupting the byssal threads themselves, the lubricant-infused surfaces were confusing the mussels, making them decide they weren't valid places to attach," says Amini. The scientists had a hunch that the SLIPS' lubricant layer was physically interfering with the mussels' ability to detect the solid surface beneath it, as they found that their feet contain proteins that are known to sense pressure. They used a tiny probe to measure the amount of force "felt" when the tip of the probe came into contact with the different surfaces and was then removed. The probe detected a "pulling" force on contact with both of the SLIPS coatings, which turned out to be surface tension from the liquid lubricant layer attaching to the probe before it reached the solid surface beneath. "We know that mussels expect to feel a compressive force from a hard surface against their feet, and this unexpected pulling force from the lubricant seems to make them not want to attach threads, in addition to the SLIPS' disruption of the thread binding mechanism," explains Amini. The i-PDMS produced a stronger pulling force than the 2D SLIPS, which is likely why it better masks the underlying solid surface and deters the mussels' pressure-sensitive feet. Finally, the Wyss team partnered with the NOAA Stellwagen Bank National Marine Sanctuary in Scituate, Mass, submerging panels of all the lab-tested materials into Scituate Harbor for sixteen weeks to see whether organisms would grow on them. "This field site exhibits a typical North Atlantic biofouling community, most notably a population of blue mussels (Mytilus edulis), which allowed to compare the findings obtained in the laboratory with observations in real-world conditions," says Stefan Kolle, a Research Associate in the Aizenberg lab at the Wyss Institute and SEAS who is also a co-first author of the paper. Not only did the i-PDMS show four times less mussel settlement than Intersleek? 900 and 30 times less than non-infused PDMS, it also outperformed the other materials in resisting other biofouling species such as tunicates, hydroids, and slime. "Many of the organisms in the field use different strategies and adhesives to attach themselves to underwater surfaces, but we have a solution that can work across most species," says Onye Ahanotu, a Senior Research Scientist at the Wyss Institute and co-author of the paper. "The beauty of this study is that we not only showed that slippery surfaces are effective against mussel adhesion, but through that investigation we also came to understand the mechanism of how mussels attach themselves to a surface from the molecular through the macroscopic scale and, therefore, how it can be prevented," says Aizenberg, who is a Founding Core Faculty member at the Wyss Institute and the Amy Smith Berylson Professor of Material Sciences at SEAS. "We now have a very detailed understanding of fundamental science coupled with successful, real-world applications, and that is quite a unique thing." "This collaboration exemplifies the Wyss' goal of combining the curiosity of basic science research with the problem-solving of engineering, taking cues from nature to develop and deploy solutions to real-world problems," says Wyss Institute Founding Director Donald Ingber, M.D., Ph.D., who also is the Judah Folkman Professor of Vascular Biology at Harvard Medical School and the Vascular Biology Program at Boston Children's Hospital, as well as Professor of Bioengineering at SEAS.